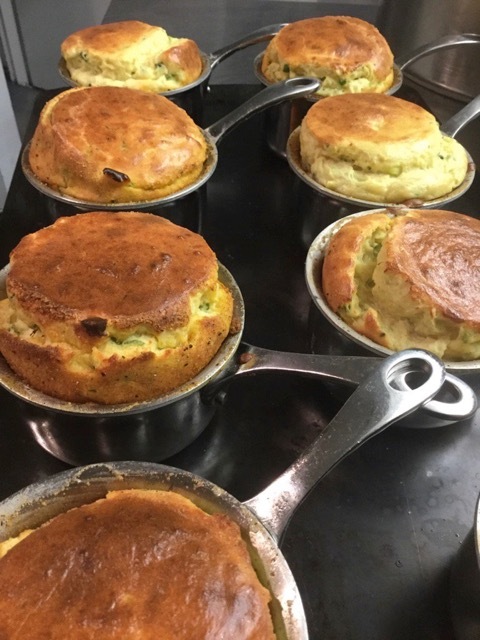 Ever made a cheese soufflé? It's easier than you think! Ever made a cheese soufflé? It’s easier than you think! Preheat oven to 200C/Gas 6. Brush butter into small ramekins, make discs of baking parchment to pop in the bottom, brush butter over the discs. Place on baking sheet. Put the onion into a saucepan with the milk, bay leaf and peppercorns. Heat gently for 5 minutes. Remove and set aside. Stir flour into the remaining melted butter, return to the heat and cook for a minute, stirring. Remove from heat. Strain the milk into a jug – measure 250ml of milk. Top up with fresh if necessary. Discard onion, bay and peppercorns. Add the milk to the flour and butter paste gradually to avoid lumps. Cook for 2 minutes, bringing to the boil, stirring constantly until the sauce becomes smooth and thick. Add the Yarg and mustard and continue to cook for a further 1–2 minutes more until the cheese melts. Stir in the thyme and season to taste. Be plentiful. Cool the mixture for five minutes, then beat in the egg yolks one at a time until thoroughly mixed.Whisk the egg whites until stiff peaks are formed. Stir a tablespoon of whites into the cheese mixture quite rapidly to slacken the mix, then fold the rest in gently, trying to preserve as much volume as possible while ensuring the white is properly folded in. Spoon the soufflé mixture into the ramekins until it almost reaches the top. Bake in the centre of the oven for 15-20 minutes until very well risen and golden-brown on top. Remove the tray from the oven and leave the soufflés to cool in their ramekins. When the soufflés are cold, release them from their ramekins with a knife and turn them into your hand. Place them in ovenproof dishes upside down. Cover with cling film and chill in the fridge until needed. When ready to serve, preheat the oven to 200C/400F/Gas 6. Take the cling film off the souffles and sprinkle with Yarg. Spoon a tablespoon of cream over the top of each souffle. Place a sprig of thyme in the middle of each. Bake for 10 minutes until the soufflés are hot and the Yarg topping has melted. Serve immediately.